Snow softens the Alpine landscape, smoothing out the wrinkles, concealing the ugliness of bare ground. In the alps, the deeper the snow the more is concealed. This is the last few yards of the Fee glacier above Saas Fee in the Valais Alps in winter. In summer the ice is bereft of snow, the bare skeleton of the glacier revealed: stark, jagged shards, collapsed ice towers. In a word – chaos. Now, as the snows of winter re-accumulate, the outlines of the glacial remains are softened and the spaces filled in. Ultimately the cavernous space may be completely snowed-over. Unrecognisable. And with each freeze/thaw cycle the surface becomes a carapace: rock hard. 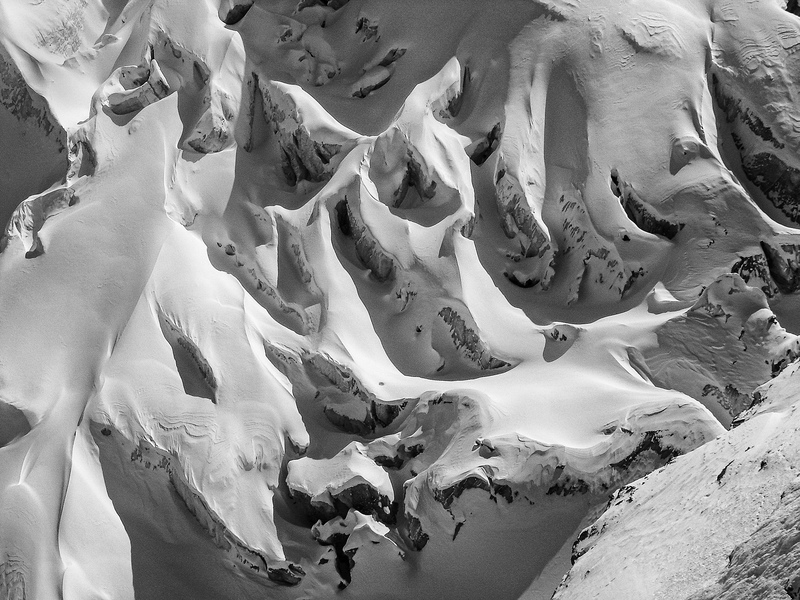 When spring arrives, for a time the carapace will remain; in places forming snow bridges that will bear the weight of a skier or mountaineer. But beware, as the air warms and the snow softens, the snow bridges will begin to melt. Early summer is the most dangerous time of year to cross a glacier. Crevasses lurk, unseen. So easy to step on what you consider to be safe ground and suddenly sink through the surface to waist height. Enough of that! Don’t want to give you all nightmares. The Holiday season is about to start. So – my best wishes to all of you reading this, whether you are people of faith or not. Enjoy the break. A time to be with family and friends, and to welcome in another year. A year that feels more uncertain than any I can remember over here in the UK. Parliament has paused, the papers for the first time in months are without the daily carnage that is Brexit. It will start all over again far too soon. This entry was posted in Saas Fee, Winter and tagged Fee Glacier, Glacier, Photography. Bookmark the permalink. Lovely image, Andy, and share some of your sentiments…worrying times. But enough gloom – season’s greetings to you and yours! Many thanks Sue – and season’s greetings to you too. A wonderful, almost abstract, shot, Andy. Happy Holidays! Many thanks Ken, and my best wishes to you and yours for the Holiday. My eye was caught by that sagging snow down in the lower left. It speaks of depth, melting, re-freezing, and such, but it also looks exactly like the sags that a varnisher fears when working on vertical surfaces! I do hope your holidays are as beautiful as this photo. Merry Christmas to you, and every good wish for the coming year! Sagging varnish, like sagging watercolour paint etc!! We shall be out skiing in six weeks – can’t wait. Have a lovely Christmas, Linda, and very best wishes for 2019. We could do with a peaceful, and politically calm year over here in the UK. Somehow I don’t think that is very likely. It will all start again, too soon – that’s for sure! You all have your hands full with Brexit, and it’s not much better over here, but then. all over the world there seems to a particular kind of unrest these days. So hold onto your hat and stay out of those crevasses, however beautiful that landscape may be. And it is beautiful, the way you photograph it. 🙂 Have a great 2019, Andy!